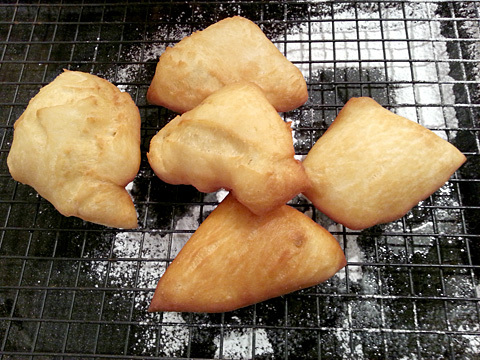 Sourdough Buttermilk Beignets | Have YOU Ben Starr Struck? Ah, beignets! France’s answer to a donut, only without a hole, and rarely round. 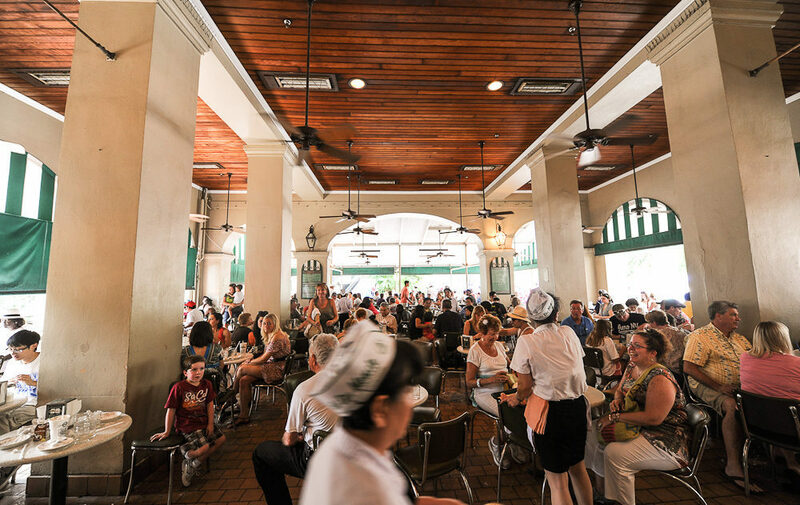 Single-handedly made famous in the U.S. by Cafe du Monde, steps from the cathedral of St. Louis in the heart of the French Quarter in New Orleans…though certainly not perfected by them. I actually grumble and groan anytime I take someone to New Orleans and they wanna get beignets at Cafe du Monde. It’s loud, cramped, dirty, and buried in powdered sugar…and their beignets aren’t really that good, anyway, nor is their cafe au lait. I’m not sure what the hype is all about, unless it’s simply a bow to tradition. 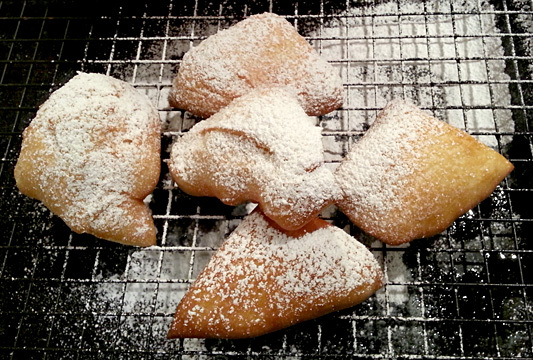 I’ve been making beignets at home for many years. They are, in fact, nothing more than an old-fashioned yeast-risen sopaipilla, which means that I’ve been making them since I was a kid, but I was just calling them by their Spanish name. As I’ve been maintaining my sourdough culture lately, I figured for this Mardis Gras I’d try my hand at some sourdough beignets. But all the internet had to offer in terms of recipes was a recipe that ALSO included commercial yeast. I’m sorry, but that’s cheating. And I’ve never been one to turn away from an idea when I couldn’t find a recipe, so I forged into uncharted waters, and the sourdough beignets that resulted were truly remarkable…tart and rich, with a soft, chewy, tender inside and an impossibly thin layer of very crisp, golden brown crust. They put Cafe du Monde’s to shame…or so said two friends who love Cafe du Monde so much they held an event at their wedding there! If you don’t have a sourdough starter yet, chances are you probably know someone who has some to share. And if not, check out my recipe for The Best Loaf of Bread on Planet Earth to start your own…all it takes is organic rye flour and a little pineapple juice, followed up with bread flour and filtered water. 4 or 5 days later, you’ll have a healthy starter (called a “barm”) that only needs to be fed a couple of times a month, and will make the most spectacular breads, biscuits, pancakes, and beignets you’ve ever dreamed of. Knead with the dough hook for about 5 minutes. The dough should be firm and clear the bottom of the bowl. If it doesn’t, add a bit more flour. If it’s too dry and doesn’t come together, add a splash more buttermilk. Transfer the dough to a bowl that’s been lightly sprayed or oiled, then cover with plastic wrap and let ferment on your countertop for 4-12 hours. For really amazing flavor and crust texture, after the initial ferment, place it in your fridge for up to 2 days before frying. When you get ready to fry, pour about 2″ of canola oil into a heavy pot over medium heat (or preheat your deep fryer) and bring the oil to 325F. Pinch off a ball of dough about the size of 2 golf balls. Roll out on a lightly floured surface to about 1/4″ thick. Then cut that flattened dough into 4 pieces with a knife or pizza roller. Don’t worry about making them look symmetrical. This is a rustic dessert. Drop the dough pieces into the hot oil and fry, 4 at a time, flipping often, until the beignets are golden brown on both sides, and nicely puffed up. Transfer to a cooling rack set over a baking sheet to drain for a few seconds, then dust with powdered sugar. Enjoy while still warm, and you’ll think you’ve died and gone to heaven! Cafe du Monde...eat your heart out! This entry was posted in Recipes and tagged beignets, buttermilk, Cafe du Monde, cajun, Creole, donut, doughnut, French, New Orleans, no yeast, sourdough, starter. Bookmark the permalink. hello, these sound delicious, i’ve had a starter for years and am trying to start making sweet breads with it. but i digress..i’m wondering if you have the measurements in weight? (ounces or grams)…since a cup of barm seems like it could be very many different amounts depending on the day/consistency/bubbliness/etc. i’ll try either way but thought it worth enquiring. Jen, I don’t notice a big difference in my beignets based on using volume rather than weight. MOST of my recipes nowadays use weight, but this is an older one. And the cups seems to do the trick whether the barm is fluffy and airy, or denser. Is this fed or unfed starter? Ed, I don’t work with just-fed starter in ANY recipe. I use unfed starter in every recipe, and when my starter gets low, I then feed it. My grandma and mom fed their starters every day. I’m lucky to feed mine once a month, and my starter has gone 4 months without a feeding and then baked the single best loaf of bread I’ve ever baked. So at least MY starter doesn’t need to be fed nearly as often as conventional wisdom states. But frequent feedings encourage the lactobacillus in the starter, resulting in more sour loaves…infrequent feedings encourage the wild yeast that results in very complex flavor and excellent texture. If you’re after tart, feed often. If you’re after flavor and texture, starve that starter! Ben. I just had to dig up your astounding Beignet recipe. I DID make them several times. I froze some so i could have easy access to them which worked like a charm. Now my 11 year old step daughter is hounding me (she has been for months) to make them again. I just had to get that Sourdough going again which I froze. But I had to tell you again, KUDOS. The kids (and grownups) LOVE THESE!!! Thanks for your enterprising and generous spirit. May it come back to you a hundred fold.